Here's a great way to celebrate the 100th day of school. Included are 10 math and literacy activities that can be used in centers, literacy take home bags or in small or large groups. 1. The 100's game--(use the 100's chart and 2 dice) Estimate how many throws of the dice it will take to reach 100 on the chart. 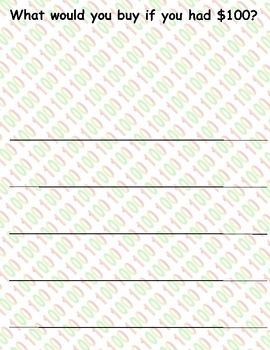 Then roll the dice, move the correct number of spaces, and draw a tally mark at the bottom of the page to keep track of how many rolls it took. See how close you were to your estimate. 2. 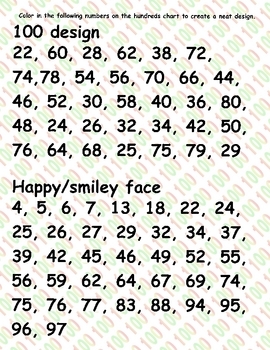 Fill in the Missing Numbers--Fill in the missing numbers to complete the hundreds chart. 4. Number sequencing--Use the popsicle sticks from patterning and place them in order from 1 to 100 using the numbers written on the sticks. 6. Counting by 5's--Use the hand cutouts with the numbers 5-100 and place in correct order for counting by fives. The numbers are written in a dotted font so you can trace the numbers as well. 7. Original reproducible writing reproducible--Write about what you would buy if you had $100. 11.Activity letter which explains how to do each activity. 100th Day of School Activities by Lisa Bates is licensed under a Creative Commons Attribution-NonCommercial-NoDerivs 3.0 Unported License.